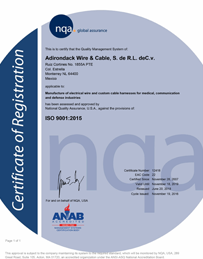 The following certifications enable consumers and businesses alike to feel confident about the quality and regulatory compliance of cable, wire, and harness products and assemblies from Whitney Blake. 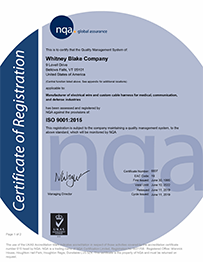 Whitney Blake quality management systems are ISO-9001 certified for the manufacture and distribution of cable, wire, cords, assemblies and other products for automotive, telecommunications, electronic, medical and other industries. Whitney Blake complies with standards for testing and certification by the United States and Canada and is authorized to use the UL, C-UL and CSA marks. IPC/WHMA A-620, a joint effort of the IPC and the Wire Manufacturers Association (WHMA), is the only industry-consensus standard for requirements and acceptance of cable and wire harness assemblies. Whitney Blake’s export and import policies are compliant with Department of State International Traffic in Arms Regulations (ITAR), Export Administration Regulations (EAR), and Directorate of Defense Trade Controls (DDTC).